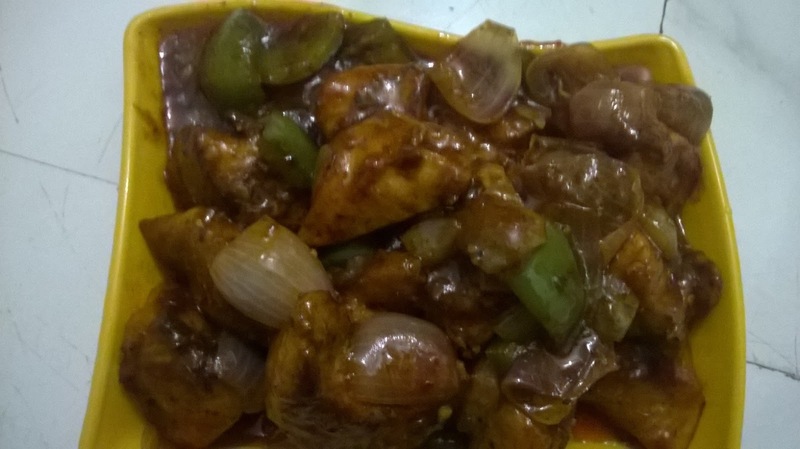 Chilli chicken needs no introduction. An Indo-Chinese delight that is very common in every restaurant. The inspiration behind this dish is my dida (grand mother from Maa's side). When I was in school, a visit to her ensured that chilli chicken would be on the menu. She, I can guarantee prepares the best fried rice and chilli chicken. In a large enough bowl, add egg, corn flour, ginger garlic paste, half of the soy sauce, half of the chilli sauce and mix well. Allow the marinade to sit for around 45 minutes to 1 hour. In a wok, add 4 tbsp of oil. Once the oil is hot, add the chicken pieces and fry them till golden brown. You may fry the chicken in batches. Take care to ensure that the chicken pieces are fried on all sides. Take the fried chicken pieces out and keep aside. In a wok, put in 1 tbsp of oil. Once hot, add the garlic cloves. Once the garlic cloves begin to get brown, add onions and capsicum. Saute till they start to lose color. Now put in red chilli powder, remaining portions of chilli sauce, tomato sauce and soy sauce. Add water and bring to a boil. Add salt to taste. It is always recommended to taste the sauce before adding salt because as mentioned earlier, soy sauce contains salt. Add the fried chicken pieces. Mix so that the the chicken pieces are nicely coated with the sauce. Cook to bring the chilli chicken to the desired consistency. Do share if you liked the recipe!! !